At last I have a bit of stitching to show you! 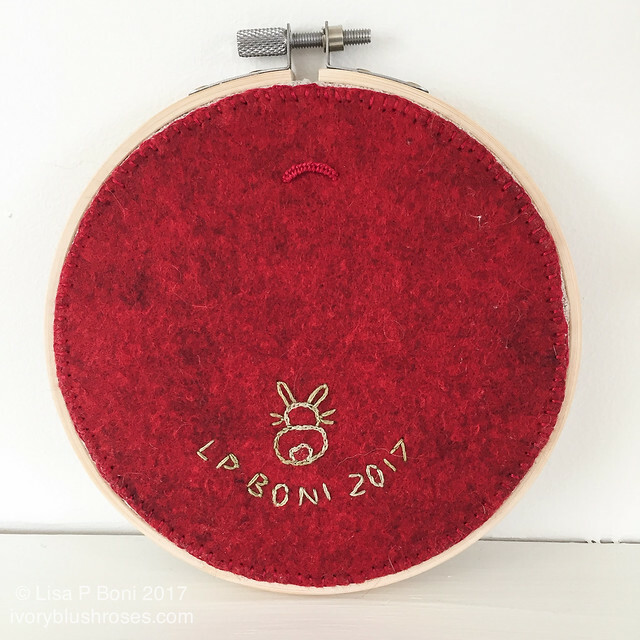 With the popularity of embroidery framed in hoops lately, I decided to give it a go with a piece of lovely coarse linen as the fabric. I've been intrigued by the idea of negative space lately and this was a great opportunity to play! 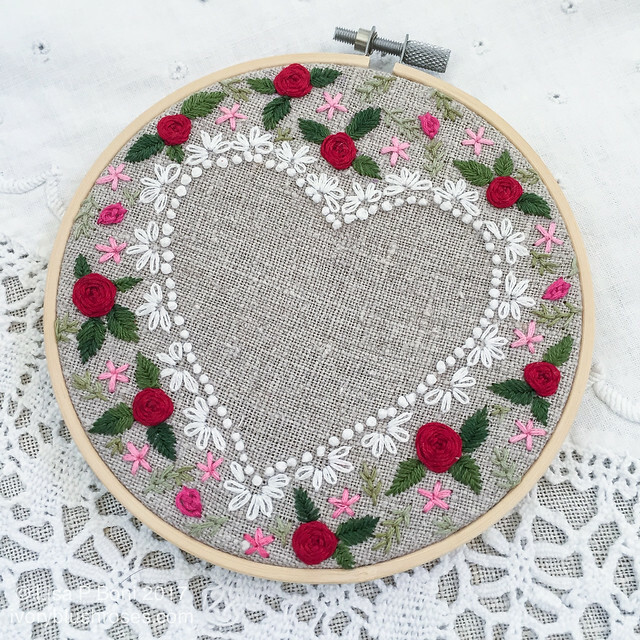 I started with framing the heart in embroidered white lace to make a lacy valentine, then surrounded it with flowers Unlike crazy quilting, where I usually use pearl cotton to make the threads stand up off the fabric, I opted to use embroidery floss for this piece. Most of it uses 3 strands, but the roses are 6 strands. Love how it turned out! A lot of the stitchers I've seen don't really finish the backs, but just run a thread around the fabric and pull tight. I did do that, but then I opted to back it with a circle of felt buttonhole stitched to the linen. Then I added my usual embroidered signature and added a buttonhole loop to facilitate hanging it on the wall! It gives it a nice finished look and it hangs nicely against the wall! Wishing all my readers a lovely Valentine's day and prayers that you be surrounded with love! 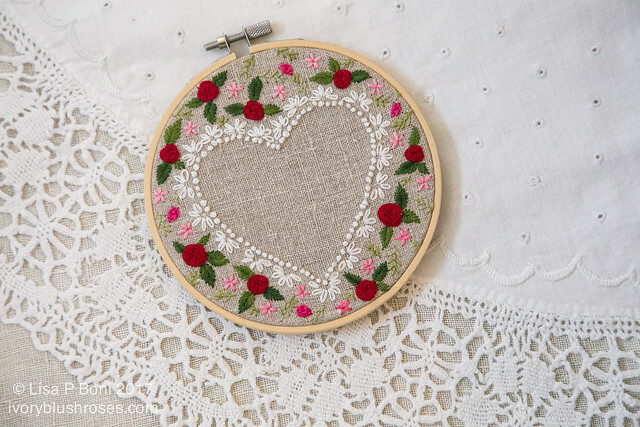 I love your embroidered heart and the way you finished it off! Another job done very well. I saw this when you posted a pic on FB. (I don't comment much there) so I'm happy that you posted to your blog as well. This is such a beautiful piece. The lace you stitched so perfect. I have never seen a hoop finished on the back and I really like it. Lovely! I like the way you finished the back. 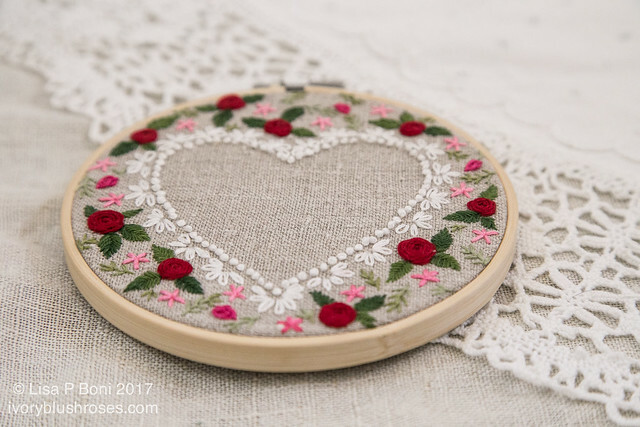 Beautiful piece - so sweet and delicate and finished so nicely. What a cute idea! I can see making little hoop pieces for various holidays. Oh Lisa it's gorgeous. I need to get back to my needlework. You inspire me! What a lovely piece! I'm always so inspired by your designs.